Hammock Zipper Location: How Do You Spin? Think the hammock zipper location is inconsequential? Think again. 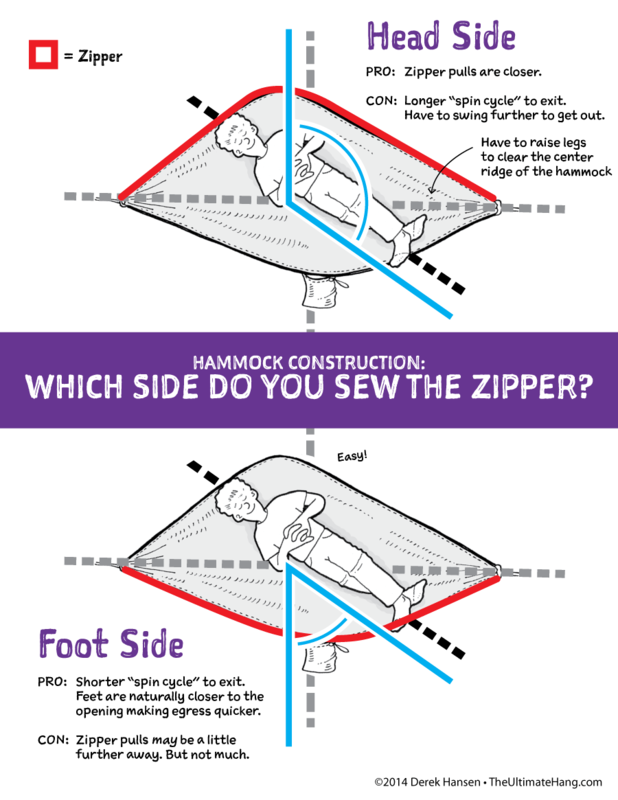 Where the zipper is sewn can make a big difference in ingress and egress on a hammock. When I sleep in a hammock, I most often lay in a diagonal with my feet shifted to the right of center and my head shifted left of center. Some hammocks are designed with an orientation one way or the another, and the placement of the zipper (for models that come equipped with a zippered bug net), determines in large part how you spin or rotate to get into position. Getting in a hammock, I recommend you spread the hammock out and sit first, laying down on your torso and swinging your feet in last. Getting out follows the opposite approach: swing your legs out and sit up. Depending on the placement of the zipper and the orientation of the lay (feet right or left), you may have to spin a little or a lot to get ready to lay down or get up. My personal preference is to have the zipper attached to the side of the hammock closest to my feet. In this way, entering and exiting is faster and easier because I have to spin less to get into position, since the angle I need to turn is smaller. With the zipper on the head side, I have to spin or rotate my body much further, extending my legs high over the center ridge of the hammock, before I am in position to lay down or get up. Now that the science is out of the way, and regardless of the tradeoffs of the two different zipper placements, what is your preferred location for a side zipper? I have the Warbonnet Blackbird so my zipper is on my head side by design. Since this is my first and only hammock so far I don’t know how I would feel about the opposite zipper position. Although, since I am a right side sleeper I have been thinking about obtaining (either making or buying-if possible) a hammock with a foot box on the opposite side. I think I prefer feet side. Not that it´s that big a deal, but head side for me. Makes it easier to open a little bit and lean out to get some gear from underneath, or get the burner going for the morning coffe. I like my zipper head side. It is a bigger “spin cycle” but I love waking up and opening the bug net to hang my head out and greet my buddies and take in the peaceful mornings. Also, with the zipper on the head side, that means the opening is closer to my arms thus giving me a better reach to adjust my under quilt if necessary. Very good points. I will update my pro list for those reasons. Simply order the regular style and accessories as you would normally do…..on the latter page of the order form there is a notes section at the bottom of the page….. state that this is to be a mirror image order (I did this with larger font setting in bold, just for good measure)…..then place your order (remember to write down your order number). >>next<< Send Brandon a note reminding him that your order # xxxx is a mirror image order. It’s easier to do than explain. On my hammocks with a zipper only on one side, I prefer foot side. It’s much easier for me to reach across the hammock than is to reach behind my shoulder. Also, I find that my torso weighs the edge of the hammock down, making the zipper much harder to operate. It’s much easier to lift my legs than my torso. If a DIY project, why not BOTH!? Best of both worlds. Yes. Although for simplicity or weight savings, one zipper is preferred. I’m getting ready to add the double zipper bug net to my hammock by DIY Gear Supply. Seeings how my whole set up is DIY Sewn by me it’s only fitting I finish the project. I’m glad to see there is no real disadvantage unless I’m missing something. I prefer the feet side. hmmm, this is a great discussion. I was about to finish up my WBBB wannabe DiY and I’m wondering now if I can either change the side the zipper is on (which would put it on the “shelf” side) or put a zipper on both sides (adjust UQ). I like my head on the zipper side, primarily for cranking up the stove without leaving the hammock in the morning. I have a Hennessy Deep Jungle with a foot side zipper, that works great, but I am planning to install just a short (eg 2 feet) and lightweight zipper at the head, so it is possible to stick my head out and also adjust the underquilt. I have double zips but always tend to get in foot side. As you suggest one ‘con’ is that it is further to reach for the zipper, I was always leaving the zipper so far unzipped it was really awkward to reach it. I now have a length of glow-in-the dark paracord running from the zipper to a running ring on the ridgeline which is easy to reach and find in the dark. I can now zip up from a semi-recumbent position. I have the zipper on the foot side of my hammock so that from the sitting position all I have to do is lay back and I’m in place!! To solve the problem of needing access to the other side of the hammock for adjusting quilts, cooking from the hammock etc. I added a 2′ zipper near my shoulder/head area to allow plenty of access for those other things! It really is the best of both worlds with ought to much extra weight!